I don't know if you're heard that Cath of the wonderful and inspirational Moxie Fab World is stepping down:( After we all picked ourselves off the floor and wiped away the tears (no lie! ), something happened that I've never seen before! 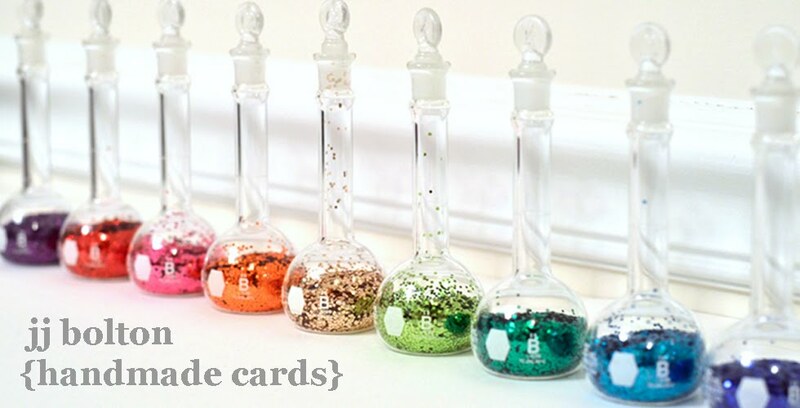 Led by the awesome Keren Baker, hundreds of carders got together (secretly) to organize this blog hop to say goodbye, give thanks, and wish Cath well! So as the saying goes, I won't cry that it's over, I'll smile because it happened:) You're the best, Cath! I will miss you words of wisdom, inspiration pics, and sense of humor. To Cath, you will always have a special place in my paper-lovin heart:) Your perspective will be missed! See you around! ADORE this JJ.....So Bright and Perfect!!!! A rainbow of beauty, JJ. Such a creative design! Somewhere over this card, I'm sure bluebirds fly. Such a lovely design! What a gorgeous, trendy, fun card... perfect for Cath! JJ, this rocks! Way to work the color! Awesome card! awesome. love that happy color action! This is so pretty!! LOVE the rainbow!!! Two of my favorite things to put on cards - rainbows and sunbursts. I love it! Oh, JJ, Cath is sure to adore this card...I sure do! So cheerful and fresh! Bright, colorful, and perfect for Cath! I knew you'd rock with dies! Love this so much! Love this happy card JJ! I am loving the coloursssss!!! This card ROCKS, Miss Lady!! Wow JJ, this is such an amazing card! Wonderful design and I love the happy colours! Moxie fabulousness, JJ! Love it! How perfect for Cath JJ! I love the bold colours. Oooh, love the negatives you left, makes it so much easier to read on the rainbow background!! But you totally knew that : ) Total awesomeness, JJ!! LOVING this card!! The colors are AWESOME!!! Love that colorful sunburst die! Perfect! Love those rays of rainbow colors! Wonderful card! Love your rainbow! A gorgeous card! Love the sunburst rainbow. Well, this just makes me happy! I really love your rainbow of colors and fabulous sentiment, JJ! I'm sure Cath will really appreciate and love it, too! Great quote and awesome card JJ! I L♥♥♥♥♥VE your card!! Big time!! I used the same die, but I always love seeing the same thing used in different ways. And the way you used it is amazing! Gorgeous! Such a gorgemous rainbow creation! Love the dimension as well as the colors & die message! Perfect bright and sunny card for today's hop - love it! So Gorgeous and brilliant design as always! So bright and happy, JJ! I LOVE those rays, and the white thanks just sets it off brilliantly! what clever use of the negative of the die cut! amazing card as always, JJ!! A slate filled with happiness - great JJ. Woo hoo, JJ!! What a fabulous RAINBOW!! Such a bright and happy card! Ok seriously JJ!!! I'm ALWAYS having to pick my jaw off the ground every time I see your creations...totally AMAZING! Wow, JJ, this is card is just brilliant and beautiful! The rainbow is so...well, colorful! What a fantastic card! MOXIE FABULOUS card JJ - LOVE it! Oh my, this is just gorgeous, JJ! Fabulous colors! Delightful card! What a great treat for Cath getting to see all these lovely creations! what a beautifully colourful card. This is a colourful gorgeous trendy amazing masterpiece JJ!! I *love* how your colours blend through your spectrum - you are a master at this!! Thanks so much for being a part of this with us, and thank you so much for your kind sweet words on my blog too! Oh JJ, you know my heart swelled as soon as I saw rainbow! GORGEOUSNESS! Such a day brightener, JJ! Cath will love it! OH so fabulous! I love the rainbow of colors! I love anything to do with rainbows. Your card is so fabulous, J.J. And I loved reading your tribute to Cath! I love all those bright colours all blended together! 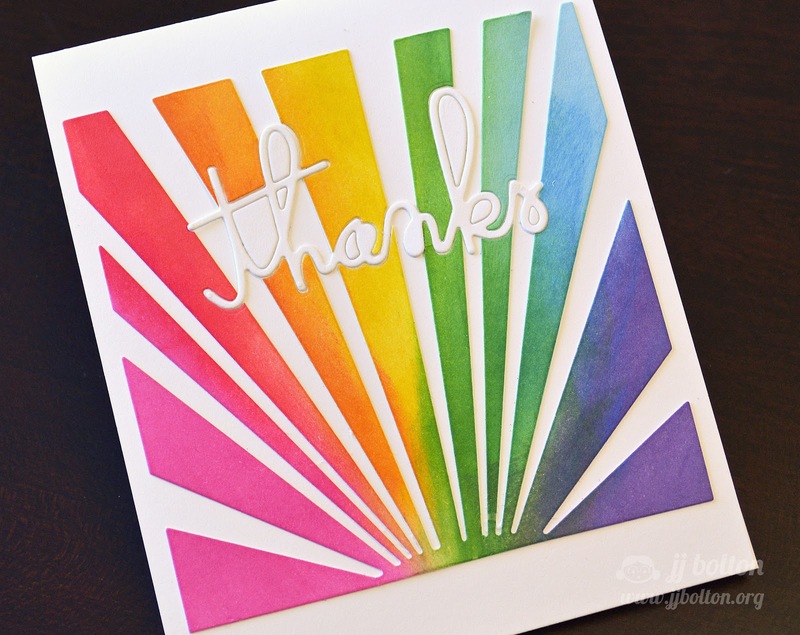 Love the rays of color...your card makes me smile! This is UBER COOL, JJ! So glad that you are part of this epic blog hop! Beautiful, the colors, the layout, and the creative use of the cut thanks. it is pretty stinking fabulous JJ! so pretty. Love the die cut part. 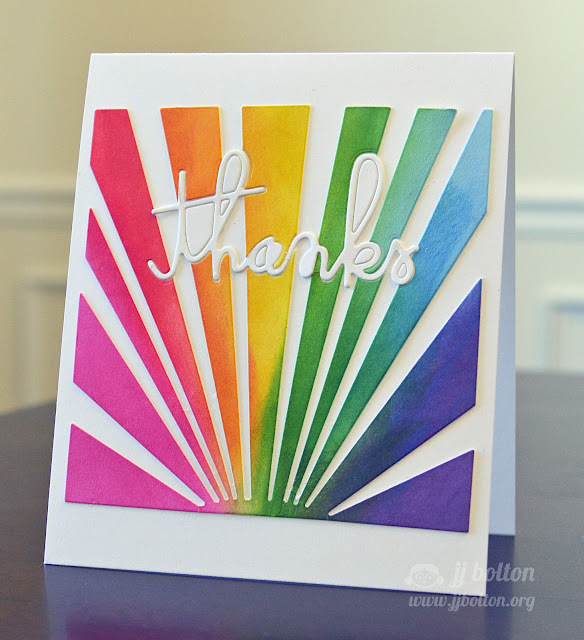 Fabulous and beautiful--love how you combined those beautiful rainbow colors and your die cut. Wow. The colours just pop! This is beautiful! I love the sun rays! Wonderful rainbow of color for Cath's moxie fab thank you card, JJ!